›14K Yellow Gold Princess Cut Black Diamond Solitaire Pendant 1.25 CT. TW. 14K Yellow Gold Princess Cut Black Diamond Solitaire Pendant 1.25 CT. TW. A princess-cut black diamond is delicately suspended in a rich 14K yellow gold 4-prong mounting. 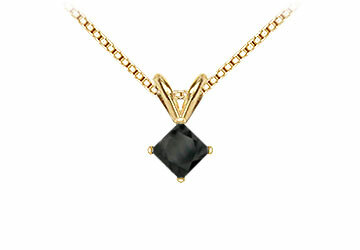 This black diamond solitaire pendant has a total weight (TDW) of 1.25 ct and comes with a standard 16 inch 14K gold chain.